386 Coast Battery RA of the 554 Coast Regt. RA. 1 x Type 25 'Armco' Pillbox. 3 x Searchlight (Defence Emergency Lighting) (2 x removed). 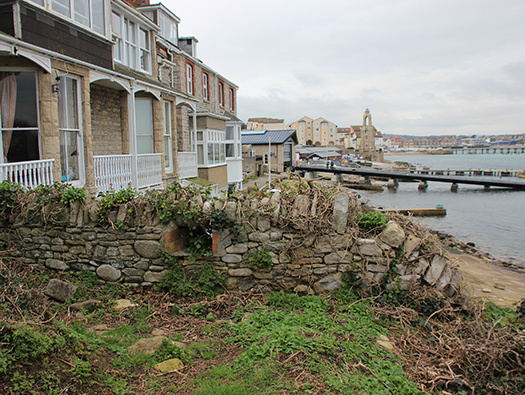 3 x gun casemates (1 x demolished). 1 x portable generator (removed). 1 x rifle embrasure in wall. 1 x Machine gun post. 1 x 5 inch gun practice gun. 2 x 4 inch. Naval Mk VII guns on Mk II mountings November 1940. 4inch WW1 Naval Mk VII on Mk IIÂ mounts. 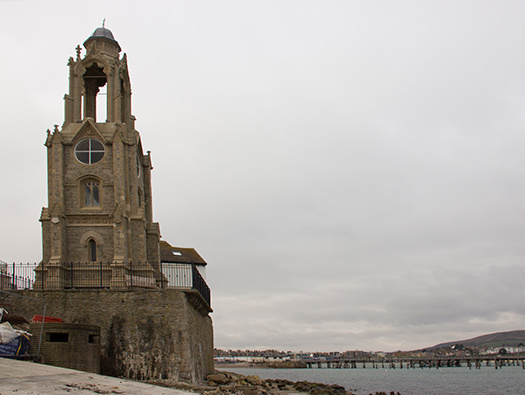 Swanage Coastal Battery, an emergency battery built during the Second World War as part of Southern Command's coastal defences. The battery was commissioned in July 1940 and mounted two 4-inch naval guns. 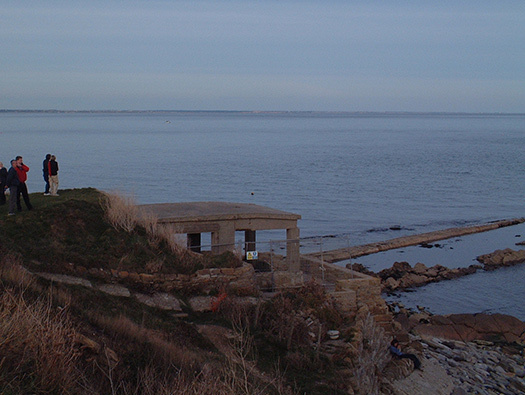 It was armed until at least May 1945 and manned by 386 Coast Battery of the Royal Artillery. 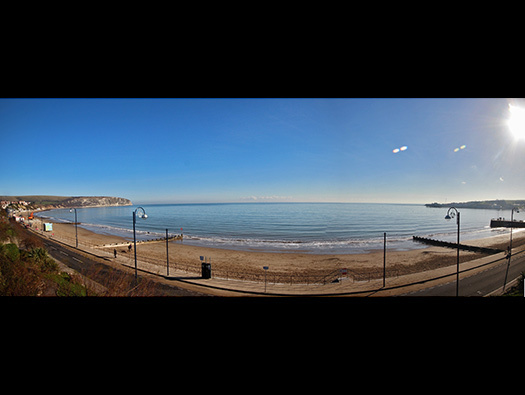 The view from the searchlight around Swanage Bay. German Armies plan to invade Britain. Learning the art of landing. B - Peveril Point Battery and another searchlight. A searchlight instillation at Scpa Flow, Orkney Islands. Home Guard with a Vickers .303 machine gun. Now converted into a viewing and sunshade for holiday makers. Searchlight with a fixed mounting. The view from behind with the new generation of bunker hunters checking out the view. Happy British home defence soldiers. The side door is the engine room, a small petrol generator would run the power via a dynamo to the searchlight in the front. A Lister generator set like the one that may have been here powering the light. This is where the light would have sat looking out to sea. 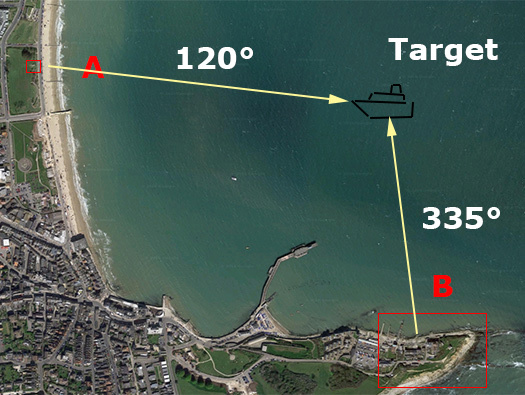 The searchlights could shine on targets and the compass coordinates would be passed to the gun battery. They would then fire on the enemy sea target. Behind most of the beaches there were also railway guns. Kept in readiness on specially made sidings to cover large areas of sea to back up the coastal artillery. Three 12” railway guns in training at Caterick, North Yorkshire. Now a very nice viewing platform. Proof against rifle fire for infantry using rifles and light automatics. 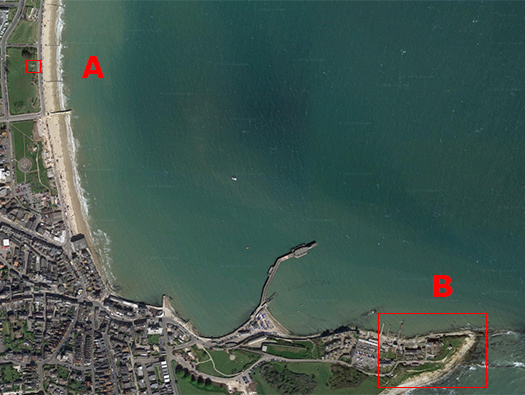 Usually found with three rifle loops and a low entrance. Walls 12'' thick and often shuttered in corrugated iron giving it a distinctive appearance. From Pillbox Study Group. Plan of a Type 25. Standard British army Le Enfield rifle. The view from one of the rifle slits. A strengthened building to hold a medium generator. Mobile Lister generator set that could have been garaged here. Also stored would be many two gallon 'Flimsies' petrol cans. There would possibly have had a double steel door on the front. 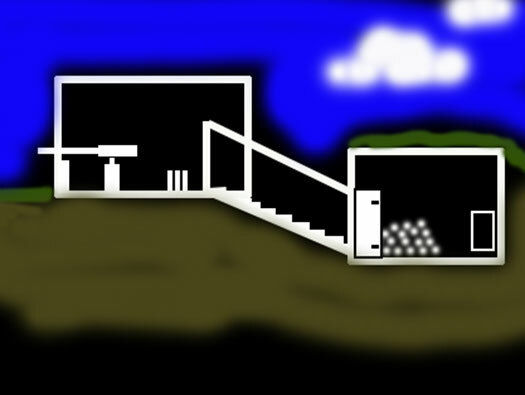 The two sloping ramps each side are covered stairways down to an underground magazine. Steps either side to magazine. Seamen loading 4inch ammunition below decks. The covered stairway to the magazine. This is how it was in 2012, the gun room has now been converted into staff area for the Volunteer Coastguard. The slopping concrete is a protected stairway down to a rear magazine where a steel door would close off the top and bottom. The second 4'' gun casemate with the battery lookout above. The 4'' gun would have sat on a bolted hold-fast in the middle of the floor. Steps to the observation platform. Compass painted on the roof. I have found this in German batterie sites as well and they were not only used in action but also a training aid to teach the guns crew where the enemy are. Barr & Stroud GK5 6x42 Director binocular Royal Navy. B.R. 1534, Handbook on Minor Fire Control Instruments. The young intrepid bunker hunter checking it out. The young intrepid bunker hunter three years older checking it out now with his sister. Gun room for a 4 inch guns were 4 inch. Naval Mk VII on Mk II mounting November 1940. A Mk II mounting hold fast for the gun. There would have been a ring of threads sticking up to hold the gun down. A ring of threads to hold down a gun. How it would have looked. Mk II mounting. The 5 inch gun was a bit of a failure and that is why they were only used in practice batteries. 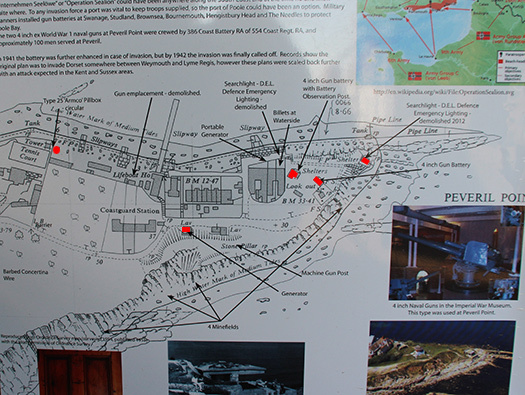 There were a few of these batteries around, one was in Gibraltar and another pivot mount found at Dunree Battery, Ireland (built when it was part of Great Britain). The gun is on a Vavasseur mounting, most of them were scrapped by 1913. I would like to thank John Guy for all his help in naming the mounting and the gun. My original caption to the picture "This maybe a gun hold fast or a winch fitting to winch in boats?? I am more of the opinion that this was a WW1 or pre WW1 gun mounting". Carriage Garrison BL 5in Vavasseur. Mk 2. Slide LBL. The same mounting at FORT DUNREE. Just noticed a rifle embrasure set into the wall. In the summer it would be overgrown and unable to see it. There was a searchlight set in its own bunker sat in the garden. This was the billets of the battery members. 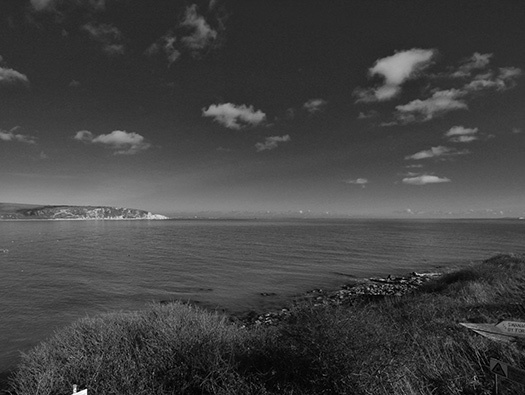 Coastal Artillery Battery Sandown Isle of Wight. 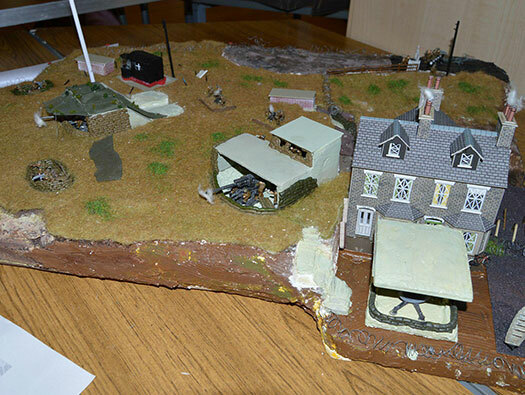 Photos of a model has come to light of what the emplacements looked like. 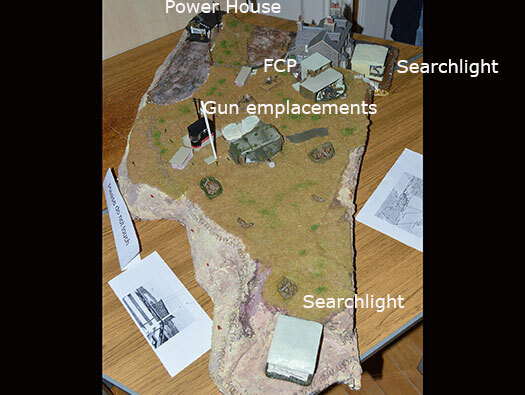 This shows a searchlight was placed into the gardens of the two cottages. British searchlight in an emplacement. Generator in a trailer but of the type that may have been used here. A British 6" naval gun in action. 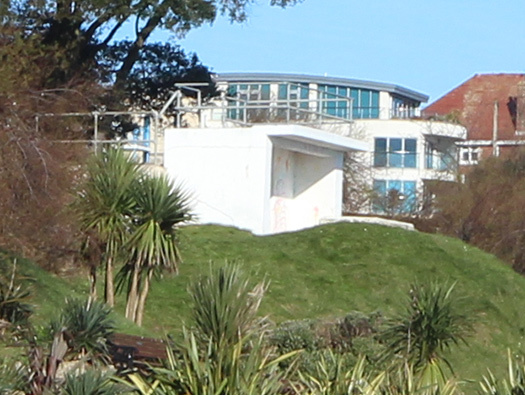 Third Searchlight demolished in 2012. This was an open concrete position. 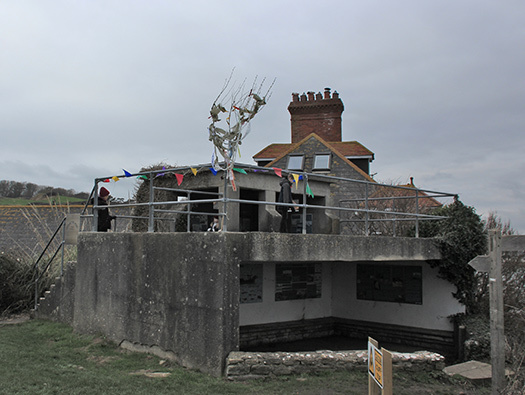 The two four inch gun emplacements.